Before your engine even goes to the dyno room the oil system is filled to the correct level with Brad Penn oil and a bottle of break in lube is added, the engine is primed and checked for pressure to confirm all components are lubricated and functioning properly. Next we prep the assembly for the Dyno chassis by installing the proper flywheel or flex plate, whether internally or externally balanced and the correct bell housing and install the engine assembly on our Stuska / DTS Dyno. The exhaust headers, heat probes for each cylinder, EGT sensors, intake manifold vacuum gauge, cooling components and electric drive for the water pump are next in line. The distributor is installed and degreed to 30° before top dead center for proper start up. Spark plugs are examined to confirm they are the correct reach and heat range, gapped to proper setting and installed. 8mm spark plug wires are custom fabricated in house for right length, tested and installed. We check and confirm all carb jetting and adjustments for the engine combination, set up the Dyno throttle to establish full open and closed throttle positions, the choke is held opened for Dyno operation. We set up the fuel inlet and confirm the fuel type needed, fill the fuel cell, hook up the fuel pump and turn it on to confirm flow, check for leaks and set operating pressure. Next we set and check float settings and fuel levels. We connect the ignition, fill cooling system using air bleed method and run final pre-fire checklist. For initial fire up, cam and ring break-in, the engine is brought up to 2500rpm, oil pressure and all exhaust gas and engine temps are monitored with someone at the control board at all times; ignition timing is set, oil pressure, fuel consumption, coolant temp and exhaust gas temperatures are continually monitored. While this is going on we look for oil leaks. After approximately 10 minutes running time and engine temperature has been achieved, we apply a 10% load to engine for a short period documenting all critical engine parameters. After this run time we shut down and let the engine completely cool down. This procedure allows proper valve spring and engine gaskets to take a required thermal set. We do this at least three times so all engine components are properly broken in. The spark plugs are pulled to confirm proper heat range, valve covers are removed and rocker arms and valve lash are checked. We re-install the plugs and valve covers and get ready for initial Dyno pull. When your engine is fired for the initial Dyno pull, we bring it to operating temp, confirm ignition timing, load the engine and pull at full throttle through desired rpm range while monitoring all engine parameters. Throttle down and shut down engine. Retrieve and study all data. Pull and read spark plugs. The pre- filter screen is checked for debris and the filter is re-installed. If proper tune was not achieved on the first pull, adjustments to correct the tune are made and another pull is done. After correct tune is met, your engine is cooled down again, the choke is hooked up and cold start confirmed, the idle speed is set and throttle response confirmed. The dynamometer data including temperature, humidity, barometric pressure, horsepower and torque output are all printed for your records. Your engine is disconnected from the Dyno, all openings are sealed, it’s stretch wrapped and placed in an engine cradle ready for pick up or for crating if it is to be shipped by common carrier. The most common answer to this question is ‘Awesome power and torque.” However, even though this usually is a nice by-product, this is not the most important benefit realized. Your engine is hundreds of parts working together towards the desired outcome. 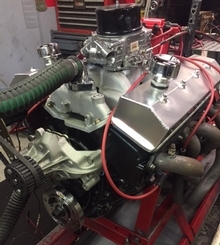 Dyno tuning your crate engine insures that all of these parts are working correctly with each other and have the proper support to provide you with a durable and reliable engine. Dyno tuning your engine also insures that you get the performance you expect and pay for; throughout the full range of rpms. Dyno tuning your crate engine is the only way to insure your engine is running as efficiently as possible. Even the best mechanic can ‘miss the tune up’. Improper tuning will rob your engine power, torque, fuel efficiency and durability. Along with a whole host of other things, incorrect ignition timing or improper fuel-air mixture can cause damage ranging from bearing failure due to detonation from a too lean condition to ring and cylinder damage due to a too rich condition and cylinder wash-down. 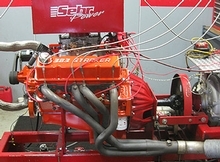 We don’t just rely on our ears or reading the plugs to set your ultimate tune-up, we have the benefit of scientifically proven information gathering to prove that your crate engine is tuned precisely as it should be and use the plug reading and our ears to confirm what the information shows. The process of doing your Dyno-tune and break in also assures you that your camshaft and lifter package are properly conditioned during break in and that your rings seat as they are designed to. Your package will be tuned to give you of quick and reliable starting, regardless of the temperature.